The two tub trolleys are all based on a basic 25mm tube frame design which holds two NALLY plastic Staka-Nesta Crates which are of the type often used in supermarkets parcel pick ups. These tubs are available in three depths and the trolley has been designed to take any combination of two of these (the amount of space between the crates depends on the sizes chosen). The top crate is suspended by the flange around the edge of the crate and the lower one rests on flat bars which are welded across the base of the trolley and is located by the tube frame. The trolley is fitted with 125mm swivel castors and can be supplied with a removable/reversible clipboard for order checking. It can also be supplied with a step stool fitted to one end to help reach stock. Only one crate can be carried when the step is fitted, however, a timber shelf is fitted to allow the rest of the base to be used. A number of combinations of these can be made, some of these are shown below. Standard design frame (powder coated) with provision to fit removable clipboard. Standard frame without provision for clipboard. Finished in hot dip gal. for use in high corrosion areas. The clipboard is manufactured from grey melamine and has a paper clip at the top and a groove to take pens at the bottom. The board is 420mmx420mm approx. and can be mounted facing either end or removed when not required. Standard trolley fitted with fold up step stool similar to domestic type. When operator stands on steps trolley is stopped from rolling away. 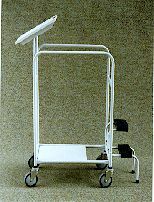 The clipboard can be reversed in the sockets on the trolley to allow the operator to push from the end with the step. In this position there is limited clearance above the tub and it may be difficult to remove if a No. 15 crate is used, but if the step is used frequently it may be an advantage to use it this way.